Dolce is a dream come true! Our beautiful Blenheim girl was bred by Hans Boelaars, Lamslag Cavaliers located in the Netherlands. 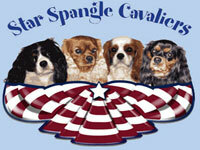 We are so delighted to have Dolce as part of our Cavalier family. Dolce is quite the Cavalier lady; sweet, loving and a Cavalier tail that wags nonstop. Words will never be able to fully convey our heartfelt gratitude to Hans. Jaïsha looked at me and I looked at her and we both looked at Hans and as they say the rest is history. All I kept saying over and over is that I really like her. I just love this precious girl and could not leave Netherlands without her. You can not help yourself from smiling when you see her. She is one waggy happy go lucky puppy. We look forward to a wonderful future and thrilled that she is part of our family. Hans Boelaars made my dream come true and we will always be filled with gratitude to Hans for letting us have Jaïsha.